On the final day of the men’s hockey preliminary round robin, it was Team USA who benefitted the most, grabbing the second seed in the knock-out stage thanks to their emphatic win over Slovenia and Canada’s overtime win over Finland. Who figured most prominently in the games contested in Sochi on Sunday? We’ll find out in today’s edition of Three Stars. The Canadian offense didn’t really play that well on Sunday afternoon against the Finns, but one player that really showed up in the game was Doughty, who scored his third and fourth goals of the tournament to help his team set up a potential semi-final matchup against the United States. On Canada’s first goal of the game in the second period, their power play unit came to the fore. They had an excellent puck cycle thanks to both Sidney Crosby and Shea Weber, and it eventually found its way to Doughty. Instead of just winding up and taking a shot from the point though, Doughty pinched in a bit and found a lane to shoot through, beating Tuukka Rask top shelf and giving his team a 1-0 lead. For the rest of regulation, the Canadian offense continued to struggle to get things going against the aggressive Finnish defensive trap, but Doughty was finally the guy that was able to break it. Using a quick push up the ice by Jeff Carter, Doughty followed in close pursuit, and got the puck near the blue line. He continued toward the slot, and using Mikael Granlund as a screen, Doughty fired a low wrister that somehow got through Rask and into the net to give Team Canada the important victory. For now, the Canadian squad will rest for a few days before they battle the winner of the Switzerland-Latvia playoff game. That contest will take place Tuesday, with Canada’s quarterfinal matchup occurring Wednesday. Austria hasn’t had the easiest time in the Olympic tournament, dropping games to both Finland and Canada by wide margins, but they finally overcame those obstacles and knocked off Norway on Sunday morning by a score of 3-1. Grabner was arguably the biggest contributor to that effort (although Mathias Lange’s 34 saves on 35 shots were critical too), and he figured in all three Austrian goals. Early in the game, Grabner made a great pass through the neutral zone to set up a rush for his squad, and then immediately drove to the net. Thomas Pock then found him with a perfect pass as Grabner glided untouched through the slot, and he potted it to make it 1-0 Austria less than five minutes into the game. Just two and a half minutes later, Grabner struck again on an Austrian power play. This time, he played pitch and catch below the goal line with Michael Raffl, and after lulling the Norwegian defense to sleep, Grabner hit Raffl as he moved toward the net, and the forward scored to give Grabner the assist and his team a 2-0 lead. Grabner may have gone quiet through the rest of the first period and most of the remaining 40 minutes of the game, but he stepped up in a big way when it mattered most. With Norway pressing to erase a one-goal deficit, Grabner made a great read and flew out of the defensive zone when Daniel Welser got possession of the puck. The ensuing clearing attempt hit Grabner in stride, and when Lars Haugen came out of the Norwegian net to try to pokecheck the puck, Grabner simply deked around him and casually put the puck in the empty net to seal the victory for the Austrians. It was a masterful performance by Grabner in a tournament that opened with him scoring a hat trick against Finland, and the win set up a winnable playoff matchup with Slovenia on Tuesday. On the day after TJ Oshie grabbed all of the headlines for Team USA with his spectacular play, Kessel continued the remarkable run that he’s been on in these Olympics by scoring three goals for the U.S. squad as they won an easy 5-1 game against Slovenia. Just a minute into the game, Kessel made an impact early. On the play, he received a pass from Joe Pavelski in the neutral zone, and the Toronto Maple Leafs forward did the rest as he sidestepped two different defenders and made a nice deke to beat Luka Gracnar to make it a 1-0 game. Kessel’s second goal also came off of a brilliant feed from Pavelski, as the Sharks forward made a perfect play off the boards as he one-timed a pass over to Kessel across the net mouth. The sniper didn’t miss the net, and the US took a 2-0 lead and total command of the game. Finally, Kessel capped off a tremendous possession that saw six different forwards make their way through the offensive zone to get chances against Gracnar. Finally, Pavelski rifled in a shot from the point that James van Riemsdyk somehow got a stick on, and despite the Slovenian goalie making the initial stop, Kessel was there next to the net to tap in the rebound and pick up the second natural hat trick in Sochi in two days (after not having one scored in Olympic competition since 1988). 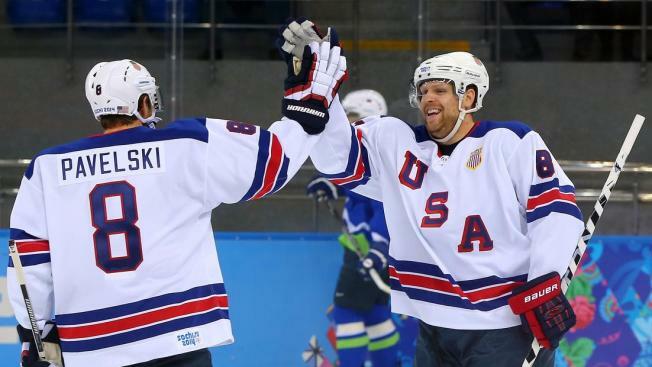 Kessel, who has figured in seven of Team USA’s 15 goals in the tournament, is a big reason why the squad is undefeated so far in Sochi, and his chemistry with both Pavelski and van Riemsdyk has the potential to spur the Americans onto great things as this tournament rolls on.